Studio A is our main working studio space. It is ideal for small and medium-sized photography and video shoots, webisodes, lookbooks, editorials, interviews, greenscreen shoots, music videos and e-commerce shoots. The space is approximately 1000 sq ft and has dimensions of 38′ x 26′ with 13′ ceilings, making it an excellent space for still photography, videos and events. South-facing windows provide ample natural lighting; windows can be effectively blacked out for total light control. Included in the rental cost is a full lighting kit! For stills, we have Profoto kits and various modifiers. Rolling stands/crossbeam for hanging seamless paper background are also included in the rental; inquire for current color selection of seamless in stock, $25 per pull. 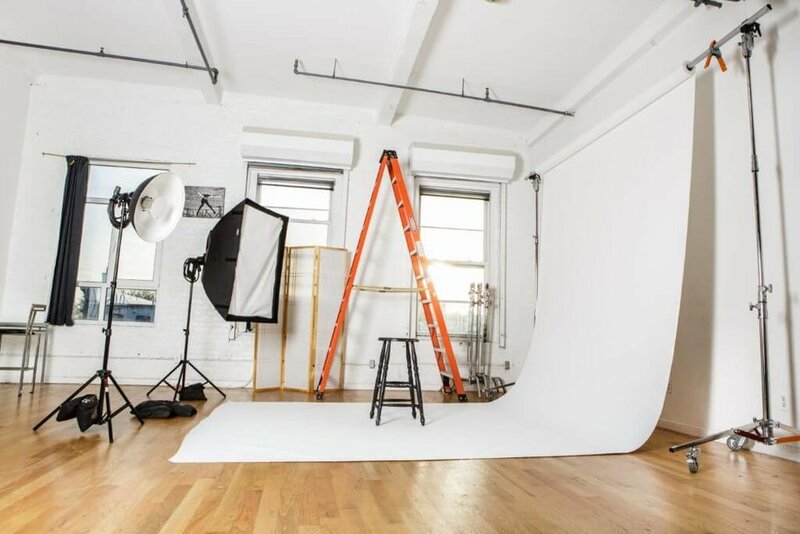 Studio A is directly adjacent to Studio B, and has a door that connects the studios to create a 2000+ Sq Foot facility, ideal for large-scale video and photo productions! For television and advertising rates please contact us. Discounts available for booking both studios or for multi-day shoots! For more information regarding discounts click here.